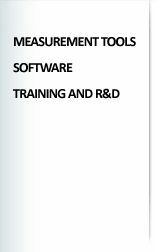 Services using CORE software are automatically signed up to the CORE User Network and are encouraged to adopt a common methodology: this includes induction training for practitioners, data management training for service managers and the adoption of a common reporting framework. Being a member of the CORE user network has advantages, the largest of which is that it allows service benchmarking to identify, develop and disseminate best practice in the provision of psychological therapy. Anonymised data from services in the user network is pooled to create a unique national database (NDB) of practice-based evidence. This NDB is used to develop - and evolve - comparative service quality indicators (benchmarks), which can help members explore their own service performance and compare with other, similar services' performance. The NDB is also used for other research purposes. Among the many topics investigated to date are; the effectiveness of differing forms of therapy, effectiveness of specific therapies for depression and anxiety (as identified by practitioners at assessment), waiting times and their impact on outcome. The benchmarking indices are usually presented in the form of anonymised, traffic-light 'thermometers'. The green band profiles the percentage range for services making up the top quartile (the 'best performing' 25%); subsequent quartiles are sequentially coloured yellow, amber and red, with red denoting the percentage range for the lowest quartile of services. Since 2004 CORE IMS, in conjunction with the CORE user network, has been developing data sources for the creation of benchmark indicators in specific sectors including primary care, workplace (EAP) and student counselling services. 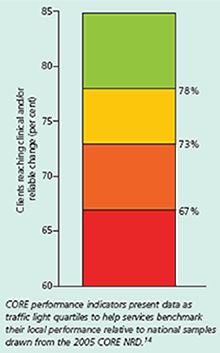 A series of benchmarks for Primary Care services were published in a special edition of Counselling and Psychotherapy Research in 2006 and updates were generated last year and are available for download. A series of benchmarks for the Higher Education sector are also available for download. Benchmarks for EAPs are currently being produced and will be available in the near future. CORE user network members are also encouraged towards active and open participation in group benchmarking workshops. Thus, the network provides a level of peer support to CORE-using services in keeping with the participatory, ground-up learning ethos that has underpinned CORE since its inception.